IE 9 – What’s Changed? Now that IE 9 has been released and is widely used, we wanted to follow up on some of our previous IE related blog posts to see how things have changed. We previously reported about the scaling back of the maximum number of concurrent connections in IE 8 when your PC uses a VPN connection. This happened even if the browser traffic didn’t go over that connection. There is a subtle difference though. 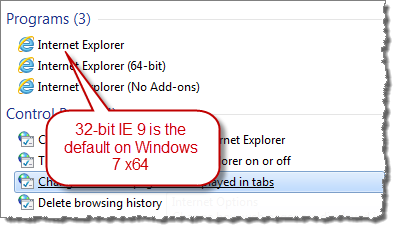 IE 8 would dynamically change it’s behavior as you connected or disconnected the VPN. In IE 9 it just seems to look for dialup or VPN connections at startup to determine the connection behavior for the rest of the session. For example, any active dial-up or VPN connection found when IE 9 starts will cause it to use a maximum of two connections per hostname. This limit remains until IE 9 is closed regardless of whether the dialup or VPN connections remain active. 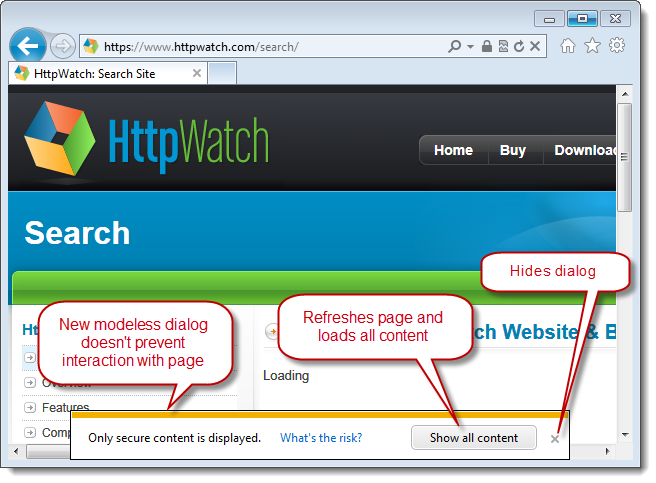 In previous blog posts we’ve covered the mixed content warning issues in IE and the problems it causes. It got even worse in IE 8 as the modal dialog was worded in a way that caused a great deal of confusion with no apparent benefit for ordinary web users. You can now ignore the message or simply click on the X to dismiss the warning. We previously wrote about why IE 8 64-bit was the not the default version of IE on Windows Vista 64-bit. This was because commonly used plugins such as Flash, Silverlight and Java did not support 64-bit. One nice feature of IE 9 is the ability to create pinned sites in Windows 7. A pinned site sits on the taskbar like a pinned application and can be quickly accessed when required. The web site can also provide customizations such as jump lists. The reason Add-ons don’t run on pinned sites is that we wanted to remove any non-site specific extension points (like toolbars and BHOs) from altering the original browsing experience created by the site. It doesn’t seem unreasonable to block a debugging tool like HttpWatch, but it’s a shame that productivity tools such as Roboform are not available. 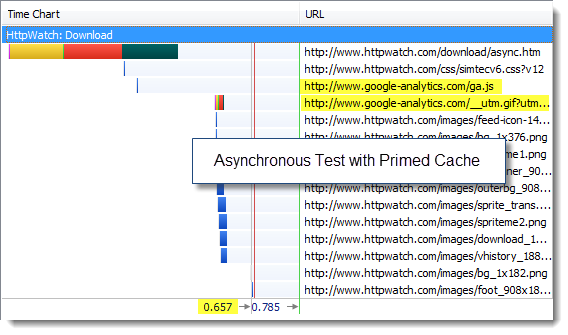 In our last post Asynchronous Google Analytics is Better but Not Faster, we ran some tests using HttpWatch in Firefox 3.6 and IE 8 to see if the asynchronous version of the Google Analytics (GA) script was really faster as many have claimed. 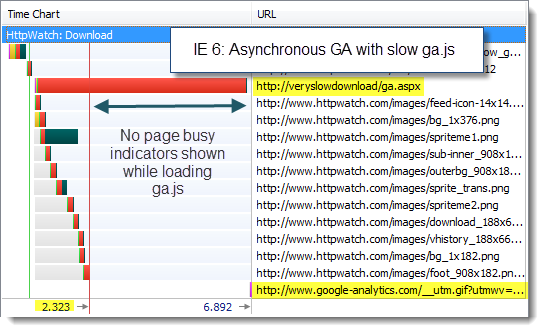 When we tried simulating a slow download of the ga.js file, we did find that the asynchronous version of GA isolated the page from this potential performance problem – but only in IE. When we simulated a slow download of the GA image beacon, we did not see a difference between the two versions of GA. In IE, the image always downloaded in the background without holding up the page load event. 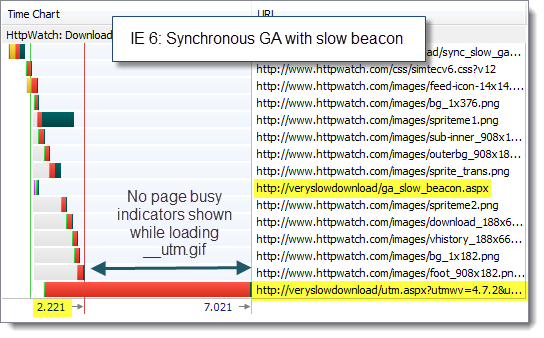 In Firefox, a slow GA beacon always held up the page load. One of the comments we received was that we should really have tested with IE 6 and 7 as those browsers are more prone to script blocking issues. 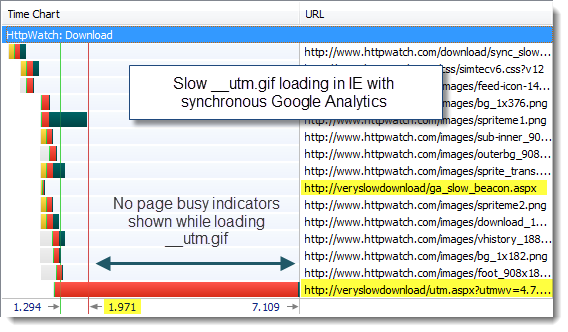 Do Pages Load Faster With Asynchronous Google Analytics in IE 6 and 7? 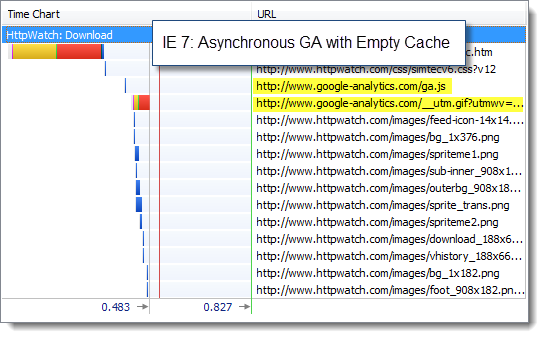 Would Google Performance Problems Have Less Impact With Asynchronous Google Analytics in IE 6 and IE 7? 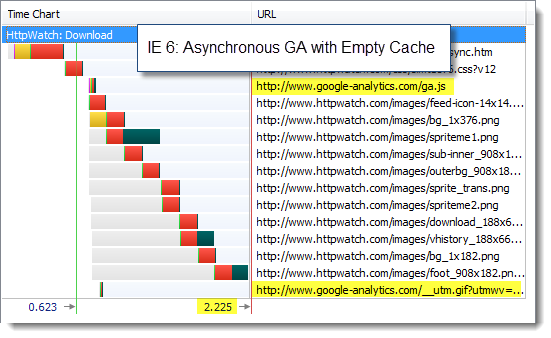 Is Data More Likely to be Recorded by Asynchronous Google Analytics During Early Page Exits in IE 6 and IE 7? 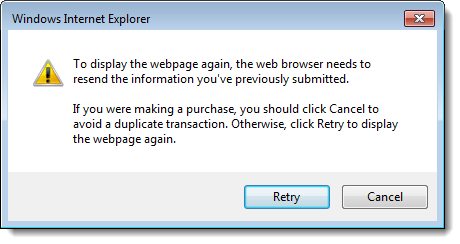 Again, we saw the same behavior as IE 8. 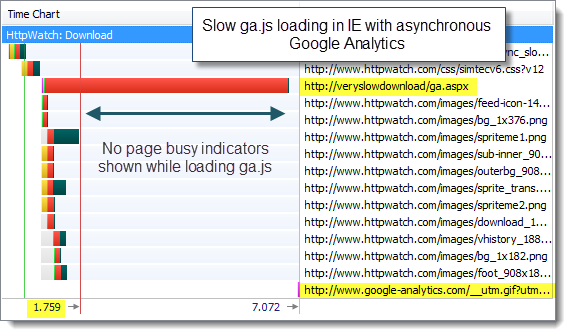 Using the asynchronous version of GA increased the chance of collecting analytics data when a user left a page early. We found no differences in our tests with IE 6 and IE 7 compared to IE 8. 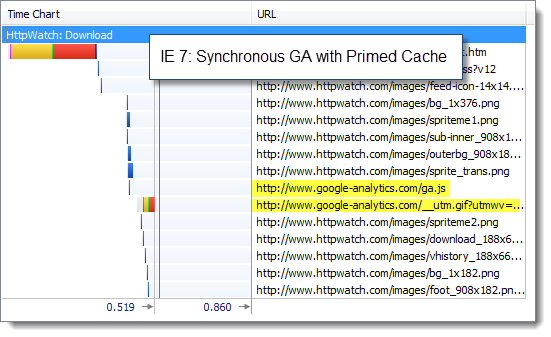 Asynchronous GA is worth using because it increases the chance of gathering data from slow pages, but you shouldn’t expect to see faster page load times unless you encounter a slow, uncached ga.js file in IE. In December 2009, Google launched the asynchronous version of the Google Analytics script. The update aimed to address potential script blocking problems that have been extensively researched and reported by Steve Souders at Google. Before applying the change to our web site we decide to compare the new and old versions of the Google Analytics scripts using HttpWatch 7.0 . The following sections describe what has changed in the asynchronous Google Analytics script and the tests we performed to compare it to the traditional synchronous version. 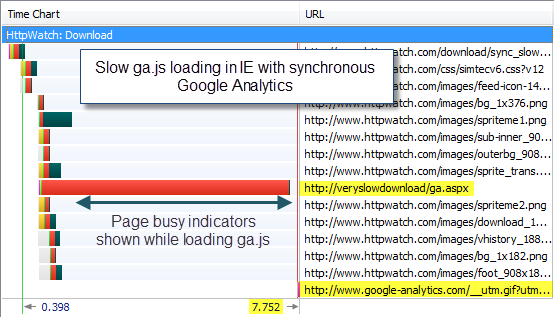 You enable Google Analytics on a web page by calling a page tracking function in ga.js. This function automatically gathers analytics data, such as operating system and browser versions, then generates the call to the image beacon. These two script tags are placed at the end of the body tag to ensure that they don’t hold up the download of any other resources on the page. The disadvantage of doing this is that the analytics call may not be triggered if the user exits the page before it has completely downloaded. It sets up the parameters required to make the call into ga.js but doesn’t invoke the function directly. A script element is added to the document allowing asynchronous download without blocking other elements of the page. The HTML 5 async attribute is also set on the script tag for browsers that support it. Once the ga.js file is loaded and executed it looks for an array variable called _gaq and executes the function with the previously specified arguments. 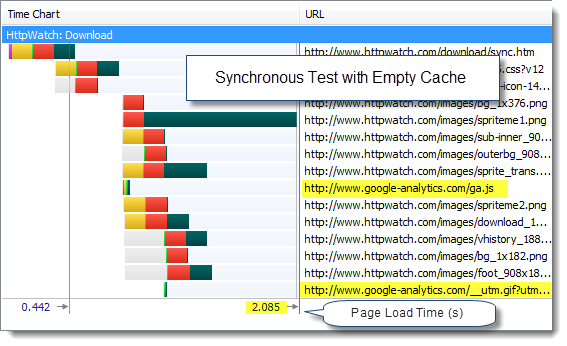 Do Pages Load Faster With Asynchronous Google Analytics? The page load times were dominated by other components on the page. Using the asynchronous version of Google Analytics didn’t really make any difference. 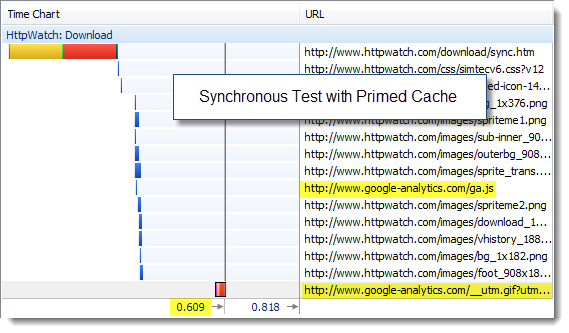 Again there was practically no difference in the page load time of the page allowing for variability in our tests. The reason for that is that calls to Google Analytics are incredibly fast (usually around a 100ms or less) and the download of the image beacon doesn’t block other components because it uses a different hostname. We tried Firefox 3.6 and got almost the same results. Conclusion: Google Analytics is so fast that you won’t see any significant improvement with the asynchronous loading version. 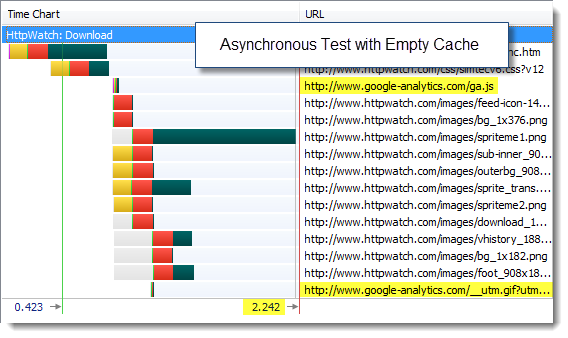 Would Google Performance Problems Have Less Impact With Asynchronous Google Analytics? For this test we needed to simulate performance problems at Google. We did this by modifying the standard script snippets to call our own ASP.NET versions of the Google files that served the same content but added a 5 second delay. We did something similar with the Google __utm.gif file so that we could add delays to either component. indicating to the user that the page was not fully downloaded. Firefox 3.6 didn’t cope as well. 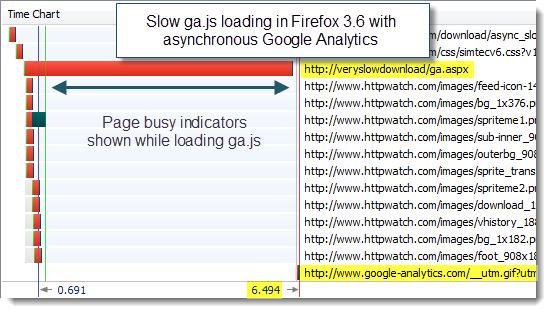 Delaying the download of the beacon file with the synchronous loading code had the same effect as delaying the ga.js file – the page load was delayed, the spinning tab icon was displayed and the status line indicated that it was waiting for data. 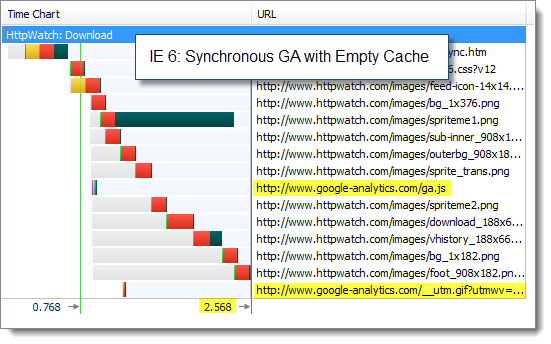 Conclusion: Using the asynchronous load made IE 8 more robust to performance problems in the loading of qa.js. Otherwise it made no difference. In reality, ga.js is often cached anyway making it the less likely of the two components to be subject to performance problems. Is Data More Likely to be Recorded by Asynchronous Google Analytics During Early Page Exits? To test this potential benefit we changed our test pages to include a slow loading script file at the top of the body tag. The idea was to emulate what might happen on your page if a third party component, such as an ad script, started to slow down. This stopped our page being displayed for six seconds. Conclusion: The asynchronous version of Google Analytics helps to ensure that analytics data is gathered in IE and Firefox when the user leaves a page early. Should I Use the Asynchronous Version of Google Analytics? Yes, but not for the reasons you might expect. It’s unlikely to make any difference to how quickly your pages load. The main reason to use it is that you are more likely to get analytics data if a user leaves a page early.